PRESS TV: It appears the lessons from the 2008 financial crisis have not been learned. The world debt is standing at $153 trillion and this is not in the financial sector. How and why has it reached this point? AZADGAN: Well, your $153 trillion figure could easily be contested. It’s actually a very generous figure. By aggregate debt, are we talking about total global debt of all governments’ debt throughout the world? In other words, which specific debt measurements are we looking at? Because as of the middle of last year (2015), the total global debt (which includes government, corporate, and household debt) reached $230 trillion! And depending on what school of economic thought you belong to, one can argue that this rising global debt is increasing the risk of another financial crisis which is the core of your question. It's not just Greece and Puerto Rico that are in default. Debt is piling up around the world, stifling global economic growth and heightening the risk of more defaults and market turmoil. 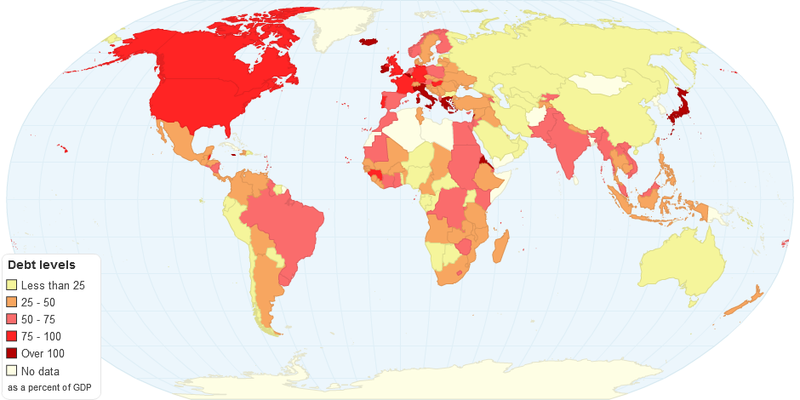 According to the Economist magazine, the following countries (moving from West to East) are in the highest debt bracket: United States, Canada, Mexico, Brazil, Argentina, Spain, Portugal, France, the UK, Germany, Italy, Greece, Holland, Belgium, Sweden, Norway, Poland, Turkey, Egypt, India, China, Japan, South Korea, Thailand, Indonesia, and Australia. In my home country of United States, we now have a public debt of $19 trillion! That comes to a public debt per person of approximately $60,000 for a population of approximately 322 million people. Our public debt as a percentage of GDP is around 95% with a total annual debt change of 10%. Again, these are estimate figures from the highly credible source, The Economist Magazine. So world leaders are caught in a Keynesian trap: More debt in the form of government & private spending is needed to stimulate today's sluggish economies. Yet the higher the debt, the greater the danger that a pullback by creditors will trigger another financial crisis like the one in 2008. This is a classic Catch 22 scenario! PRESS TV: High levels of global indebtedness might not be a matter of major concern in a rapidly growing world economy. But today's economy is not growing rapidly & is beset by major economic risks and with such a confluence of major risks in so many different parts. What are your thoughts on that? AZADGAN: The post-2008 world, or as we are now correctly calling it in our macroeconomics textbooks, “The Great Recession”, is a world of high debt, and it doesn't take much for it to crumble again because the fundamentals are deeply flawed. It only takes a bad shock for the debt dynamics to go wrong. The slower global growth in the past few years can be contributed partly because of excessive debt. We have to be ready to see other episodes of this kind such as the recent Greek default that shut down the country's banks and intensified fears of a Eurozone breakup until a new bailout was negotiated. Although a new bailout proposal did quiet the Greek drama, a long-term solution for the euro area is hard to see. Governments have generally pursued one of two strategies since the global financial crisis, though neither has been notably successful. Europe has largely slashed spending to get a control on government budgets, but the result so far has been minimal growth and high unemployment in Greece and throughout the Euro Zone minus Germany. The second approach, adopted by the U.S. and China, pumped hundreds of billions of dollars into all kinds of public projects. But growth in these economies, while better, has hardly been spectacular. Meanwhile, central banks around the world did cut their interest rates & issued unprecedented amounts of bonds to spur borrowing and spending. The result is that by the middle of last year, total global debt (government, corporate, and household debt) reached $230 trillion, an increase of $88 trillion from the end of 2007, according to McKinsey Global Institute. That's about $33,000 for every person on the planet! The rising leverage, particularly in developed economies, is all the more striking given the extensive fiscal belt-tightening, write-offs by creditors and stricter lending conditions imposed since 2008. The trend points to the growing importance — as well as risks — of the financial sector and is entrenched role in economies. With markets around the world more integrated today than ever before, troubles in one small corner of the globe can ripple far beyond, as seen by Greece's outsized effect on Europe or the 2008 Lehman Brothers collapse, which helped trigger the global financial crisis. It’s not just somebody else's debt or liability. Yet without an international framework for managing sovereign debt problems, we should expect world leaders to lurch from one crisis to the next. This is one area where we have no global governance and even the theoretical concept of global governance itself is highly frightening and controversial. Personally, I’m keeping a watchful eye on Italy and Spain. Despite international bailouts and some progress in restructuring their economies, government debt obligations in both countries have kept climbing and now stand well above the warning level of 120% of economic output, or gross domestic product. Reflecting this vulnerability, their stock markets took some of the biggest hits during the escalation of the Greek crisis. They also saw spikes in government bond yields, a reminder of how much their borrowing costs and public finances are linked to international investors' sentiment and the future path of interest rates. In the past, waves of sovereign defaults have started with movements in interest rates. In recent years governments have financed spending by selling and buying trillions of dollars of bonds. That's helped to hold down interest rates, fueling more borrowing. Although no one knows how much is too much, high debt historically is associated with impaired economic growth. PRESS TV: Of particular concern has to be the over-indebtedness in key regions of the global economy, such as the emerging-market economies, which now account for around 40% of world GDP. Why has that increased so fast? This makes the emerging market economies particularly vulnerable to crises at a time that their currencies have plummeted and at a time they are being hit by a major bust in international commodity prices. AZADGAN: Yes, the mounting debt burdens in developing nations, particularly in Asia and Latin America, threaten to become a drag on global growth. You are correct in that assertion. A net half a trillion dollars was estimated to have flowed out of developing countries last year, according to global banking industry group Institute of International Finance. After years of powering the global economy, emerging markets are caught between fading growth & tighter lending conditions, squeezing their private sectors, which had borrowed heavily during an era of low rates. The fallout from any debt defaults can spread fast: Foreign banks have lent $3.6 trillion to companies in emerging markets, and foreign investors hold, on average, 25% of local debt in developing economies. Standard & Poor Ratings Services said corporate defaults in emerging markets rose in 2015 to their highest levels since 2004. Corporate-debt downgrades in the five largest emerging economies outside of China increased six-fold over the past two years to $154 trillion. Companies borrowed heavily in recent years, betting on stronger consumption, higher commodity prices and faster economic growth. Instead, growth in developing nations averaged less than 4% last year, nearly three percentage points below IMF’s 2011 forecasts for 2015, and commodity prices have plummeted. China, which accounts for a third of emerging markets’ combined GDP and more than half of its debt, is the epicenter of the fears jolting the global financial markets. A faster-than-expected slowdown in China has rattled economies on every continent. China’s economic growth last year slowed to 6.9%, its weakest pace in a quarter century. Cracks have already begun to appear in industrial sectors plagued by overcapacity and high debt burdens. Debt problems also are brewing outside China. Creditors are now charging more for companies to borrow, which could hurt corporations seeking to roll over their existing debt. The interest rate on nonfinancial corporate bonds in emerging markets has risen from about 5.5% six months ago to nearly 7.2% now, according to a Bank of America Merrill Lynch index. Moving to another Asian economic giant, Indonesia, Indonesian corporations increased their debt by 41% from 2010 to 2015. Globally, emerging-market corporate debt has risen 30 percentage points since 2008 to 88% of developing economies’ GDP. China’s corporate debt is 130% of GDP. In the U.S., it is 70%. IMF has cut its outlook for global growth this year by 0.2 percentage point, to 3.4%, a small improvement from 2015’s 3.1% rate. It warned that economic turmoil in China and financial contagion throughout emerging markets could pose problems for global growth. Emerging and developing countries are now confronted with a new reality. Another bout of global risk aversion could lead to further commodity price decline and depreciating exchange rates. Global leaders need to craft new crisis-fighting tools to help developing nations which now consists of 40% of the world’s economic output. Still, unlike the Latin American and Asian crises of the past, many nations have a better bulwark against this new economic contagion. Many have since boosted currency reserves, giving them firepower to stem market runs & bolster the financial system. Brazil, for example, ramped up its reserves from about 5% of GDP in 2000 to roughly 20% now. China’s stockpile of over $3.3 trillion has helped Beijing avoid a sharply damaging depreciation of its currency. Many have also allowed greater exchange-rate flexibility, an economic cushion that offsets downturns by making exports more attractive and the economy more globally competitive. In previous episodes, fixed exchange rates were forced into sudden, big movements that triggered panic & fueled market turmoil. PRESS TV: Non-financial enterprises in China, the world’s 2nd largest economy, have gone on a borrowing spree of historic proportions. Over the past seven years, the debt has increased by a staggering 90% of China’s GDP. What is you assessment on China? AZADGAN: China is my biggest long-term concern when it comes to debt. China is the world's second largest economy, soon to surpass that of the United States. Again, according McKinsey institute, China's total debt has nearly quadrupled since 2007, to more than $30 trillion, much of that from excessive lending for real estate and related industries. The turmoil that we saw last summer in the Chinese stock markets was caused in part by heavy borrowing by investors. This, of course, raised further questions about the country's financial underpinnings. Still, China's overall debt situation is nothing like countries in Europe. China's economy may be slowing but is still growing rapidly, at about a 7% annual rate so far this year. The nation's debt is fairly concentrated and has little exposure to risks from outside investors. Plus, China has more capacity than most to deal with its debt load, given the country's unusually high saving rate of about 50%. Also, it's not just about debt level, but whether a borrower can service it. And again, I don’t see a big problem I this area when it comes to China. PRESS TV: Debt to GDP ratios in the European economic periphery, and in key European countries like Italy, remains at disturbingly high levels combined with uncertain European politics. European banks continue to hold a disproportionate amount of their countries’ sovereign debt on their balance sheets. What are your geo-economic assessments on Europe? AZADGAN: Well, the European debt crisis (often also referred to as the “Eurozone crisis” or the “European sovereign debt crisis”) is a multi-year debt crisis that has been taking place in the European Union since the end of 2009. Several Eurozone member states (Greece, Portugal, Ireland, Italy, Spain, and Cyprus) were unable to repay or refinance their government debt or to bail out over-indebted banks under their national supervision without the assistance of third parties like other Eurozone countries, the European Central Bank (ECB), or the IMF. The detailed causes of the debt crisis varied. In several countries, private debts arising from a property bubble were transferred to sovereign debt as a result of banking system bailouts and government responses to slowing economies post-bubble. The structure of the Eurozone as a currency union without fiscal union contributed to the crisis and limited the ability of European leaders to respond. European banks own a significant amount of sovereign debt, such that concerns regarding the solvency of banking systems or sovereigns are negatively reinforcing. As concerns intensified in early 2010 and thereafter, leading European nations implemented a series of financial support measures such as the European Financial Stability Facility (EFSF) and European Stability Mechanism (ESM). The ECB also contributed to solve the crisis by lowering interest rates and providing cheap loans of more than 1 trillion euros in order to maintain money flows between European banks. We then had the ECB calming financial markets by announcing free unlimited support for all Eurozone countries involved in a sovereign state bailout. Return to economic growth and improved structural deficits enabled Ireland and Portugal, for example, to exit their bailout programs in 2014. Greece and Cyprus both managed to partly regain market access in 2014. Their bailout program was scheduled to end last month. Spain never officially received a bailout program. Its rescue package from the ESM was earmarked for a bank recapitalization fund and didn’t include financial support for the government itself. The crisis had significant adverse economic effects and labor market effects, with unemployment rates in Greece and Spain reaching 30% and was blamed for subdued economic growth, not only for the entire Eurozone, but for the entire European Union. As such, the crisis can be argued to have had a major political impact on the ruling governments in 9 out of 19 Eurozone countries, contributing to power shifts in Greece, Ireland, France, Italy, Portugal, Spain, Slovenia, Slovakia, Belgium, and the Netherlands, as well as outside of the Eurozone, in the United Kingdom. PRESS TV: We keep hearing about a financial crisis about to recur in the U.S. One analyst even stated that we're going to have a serious recession and negative interest rates before the election. Chief among concerns are a growing bubble of debt that has accumulated in the US, which is even bigger than the real-estate bubble that burst in 2008. What is your geo-economic assessment of the U.S. economy? AZADGAN: Well, contrary to all the fear-mongering by the US presidential candidate Donald Trump and the all doom-and-gloom books written about 2016 - and in particular April of 2016 - being the year of the collapse, the U.S. debt picture looks stable, at least for now. Though public debt as a share of GDP rose to 95% last year, as I stated earlier, the government's budget deficit has been shrinking and is now at a seven-year low, thanks largely to continuous job and economic growth. U.S. banks and other corporate balance sheets are the strongest they've been in years. And consumers aren't nearly as strained as before, in part, because of the foreclosures and write-offs of the last decade. Household debt-service (the share of after-tax incomes needed to pay interest and principal) is now down to the levels of the 1980s. But to be sure, America's budget pressures will build as healthcare and Social Security obligations increase with the nation's aging population. And debt burdens can be expected to rise as the Federal Reserve is moving to gradually lift interest rates in the years ahead. That means money won't be as cheap, and governments, businesses and households around the world will need to boost incomes or cut spending to manage their debts. At the same time, U.S. growth prospects look generally sound, especially compared with most other advanced economies. And Uncle Sam isn't likely to have trouble finding investors to buy its bonds. When there are global problems, the U.S. often profits because there's a flight to credit quality. PRESS TV: Japan, the world’s third largest economy, is stalling yet once again and slipping back into deflation at a time when credibility in Abenomics is rapidly dwindling. What are your thoughts on Japan? AZADGAN: No country is in a bigger hock than Japan; its public debt was a whopping 260% of its GDP last year, the highest in the world, according to the McKinsey institute. Most of that, though, is owed to Japanese citizens and its own government, as opposed to external or foreign creditors as in Greece's case. Let’s take a closer look at Japan. Japan has a total public debt of $15 trillion, with a public debt per person of $100,000, with an approximate population of 125 million people. And as I stated earlier, Japan’s public debt as percentage of GDP is a monstrous 260%. Interestingly, the total annual debt change is - 2%. So despite its inability as yet to pull out of its long economic doldrums, the Japanese government isn't operating in fear that investors will suddenly get nervous & run for the exits. In weighing debt sustainability, what matters is who holds the loans and the credit reputation of the borrower. I, for one don’t agree with the premise that Abenomics credibility is rapidly dwindling. PRESS TV: Lastly, Brazil, the world’s seventh largest economy, is in the grips of a deep political and economic crises that could put the country well on the path to defaulting on its debt. What is your analysis of Brazil? Again, according to the Economist Magazine, Brazil only has a total public debt of approximately $2 trillion, with a public debt per person of approximately $9,500, with a total population of around 200 million people. Brazil’s public debt as a percentage of GDP is 55% & the total annual debt change is 10%, the same as the US. So statistically, these numbers aren’t alarming at all. However, Brazil’s joining in the non-aligned movement of the BRICS nations has put it in Washington’s hegemonic crosshair. Geopolitically speaking, it is true that Brazil’s political stalemate situation is feeding investor angst in a range of countries that have made little headway in overhauling their economies. Brazil is grappling with corruption allegations that are affecting the highest levels of government. A government shakeout has fanned market selloffs across South America and in Brazil, the economy is entering a second year of recession.